Chessie is probably the most endearing and certainly one of the most successful corporate symbols in American history. In 1933, L.C. Probert, a C&O official charged with public relations and advertising, saw an etching in a newspaper of a cuddly little kitten sleeping under a blanket with a paw thrust contentedly forward. 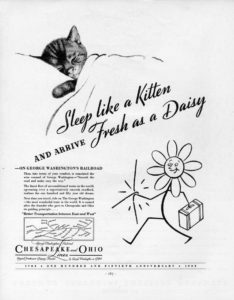 At the time, he was developing an ad campaign to popularize C&O’s new air-conditioned sleeping car service, and hit upon the notion of using the kitten with the slogan “Sleep Like a Kitten and Arrive Fresh as a Daisy in Air-Conditioned Comfort” for the C&O passenger ads. Chessie’s first appearance on behalf of C&O was in the September, 1933 issue of Fortune magazine, in an ad that carried “Sleep Like a Kitten” as its slogan. Printed in black and white, the ad carried no reference to the name of the kitten. 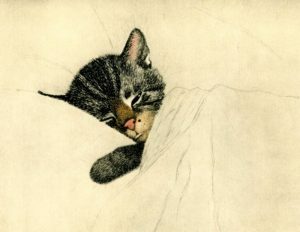 The original color etching from which the advertisement was taken is by Guido Gruenwald, a Viennese artist who specialized in cats and other animals. It was purchased for $5 for the railway’s use. The C&O’s advertising agency built a whole campaign around the kitten and chose the name “Chessie” from the railroad’s name. In 1934, the first “Chessie” calendar was produced, with 40,000 copies distributed. Advertisements featuring Chessie appeared in most national magazines as well. Her popularity grew, as did her family. She got two look-alike kittens in 1935, and a mate, “Peake” (from the railroad name as well – Chesapeake = “Chessie-Peake”), in 1937. 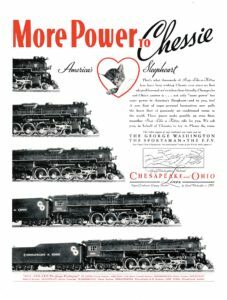 Soon Chessie, “America’s Sleepheart,” was the talk of the railroad world, and propelled C&O to the top ranks of rail advertising. In an era less complicated than our own, Chessie became the darling of millions, helped bolster the spirit of the depression-ravaged people, and then seeing them through the great conflict of World War II. Chessie lead the way as “America’s Sleep Warden” and gave up her Pullman berth for traveling soldiers. After the war, she returned to her passenger promotional work for the railway that had itself become widely known as “Chessie.” After the takeover of passenger service by Amtrak in 1971, Chessie took on a new role, giving her name to the combined C&O, Baltimore & Ohio, and Western Maryland railways under Chessie System, and helped them sell their freight service. Today, Chessie no longer appears in timetables or on locomotives and rail cars, but she nevertheless is alive in the hearts of millions who grew up during her life’s work on the C&O and successor lines. Interest in her and her history is perhaps as great now as when she was the foremost advertiser of rail passenger service.